In a bustling city like Ho Chi Minh, you are more likely to meet Vietnam at its most cores. Fleeting images of ancient pagodas, street markets, shops selling silks, spices and baskets, high rise business district and countless motorcycles denote Ho Chi Minh. Crossing a busy road might be a task for the travellers. Ho Chi Minh is known as shopping paradise among Malaysians. 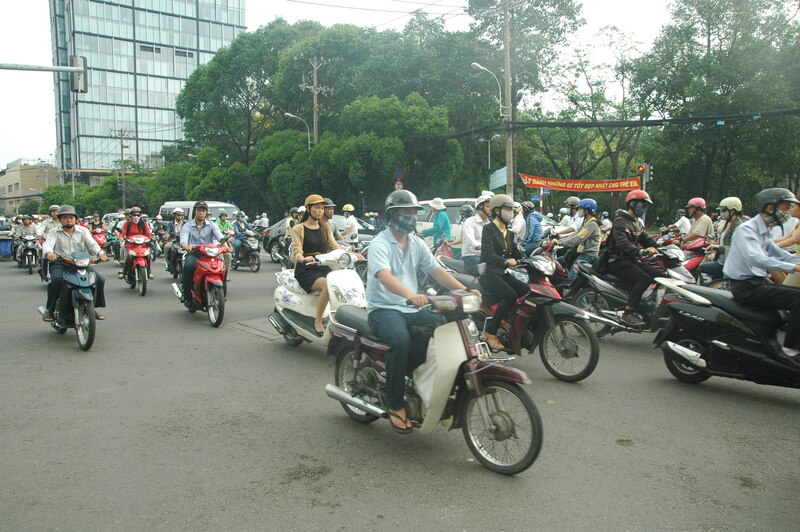 Ho Chi Minh is inhibited by more than 7 million people, divided into several districts. Start your day with a steaming bowl of Vietnam’s most famous rice-noodle soup, pho. Enter the indoor Ben Thanh Market for initial shopping. Just across the road near the roundabout, there stand a statue of Tran Nguyen Hai. Then make your way to the Museum of Ho Chi Minh to have an idea on the communist struggle for power in Vietnam many years ago. Drop by War Remnant’s Museum for better understanding on Vietnam War crimes and their consequences which is situated few blocks away from the Museum of Ho Chi Minh. Then walk through the deserted halls of Reunification Palace, always striking an eerie feeling reminiscing the morning the first communist tanks rumbled and crashed through the wrought iron gates. Stroll down the road at Le Duan, to stop by and look at Notre Dame Cathedral and French style main post office. Buy some lovely stamps and post letters and postcards to the loved ones back home. Head straight to Colon at District 5 to explore the treasure trove of interesting Chinese style temples – Quan Am Pagoda, Phuoc An Hoi Quan Pagoda, Tam Son Hoi Quan Pagoda and Thien Hau Pagoda. Also known as Vietnam’s Chinatown, Chinese and Vietnamese street food is available along the roads to the Pagoda. Don’t forget to visit Binh Tay Market and An Dong Market. As your day curtails down, do not miss the Vietnamese Water Muppet Show showing daily at 5.00p.m., 6.30p.m. and 7.45p.m. at Golden Dragon Water Puppet Theatre. After one full day exploring Ho Chi Minh, one of the better options is to head to Mekong Delta on an organized tour. Before you reach Mekong Delta, enjoy the panoramic view of the lush paddy fields known as Vietnam’s rice bowl. At Mekong Delta, the river is sprung with colourful floating markets, and waterways. Travellers will have the chance to take sampan along the waterways to watch authentic Mekong Delta life. En-route to a handcraft store and typical farm to taste the local fruit. Next, you will board a sampan for more adventurous cruise over Xep Canal. Before returning back to Ho Chi Minh, drop by at Vinh Trang Pagoda. Visit the Cu Chi tunnels, a maze of interlinked tunnels built by the Viet Cong during the Vietnam War. These tunnels were barely one meter high and ran 80cms across and were used as supply routes, kitchens, hospitals and training facilities. Once an effective base to launch guerrilla attack, the underground tunnel has a combined length of more than 200km. Don’t forget to try your hands on the guns at the shooting range. What if you do have more than 3 days? Head to Mui Ne or Nha Trang or Hue or Hoi An. *to be revised once I get back from Ho Chi Minh. thanks fara! i’m sooo gonna need this! going to HCM this may! Trip gedik santai nak shopping je ni. Harap-harap dapat la pergi explore tempat-tempat menarik terutamanya Mekong Delta tu. Wait for the updates ok.
Have a great Ho Chi Minh trip, Farah !! Thanks Wak Jan. Trip nak shopping barang outdoor. btw as usual klu berjalan ngan ‘akak-akak’ ni, ermm harus la bersoping je xtvt nya..
adoiyaaii agak2 dapat x ek nk ke mekong & chu chi tunnel?? ?